Entertainment industry studies and music business students enjoyed a unique opportunity to earn credits in three courses—Activity and Adventure Tourism, Music Business and Wellness—in Australia this summer. 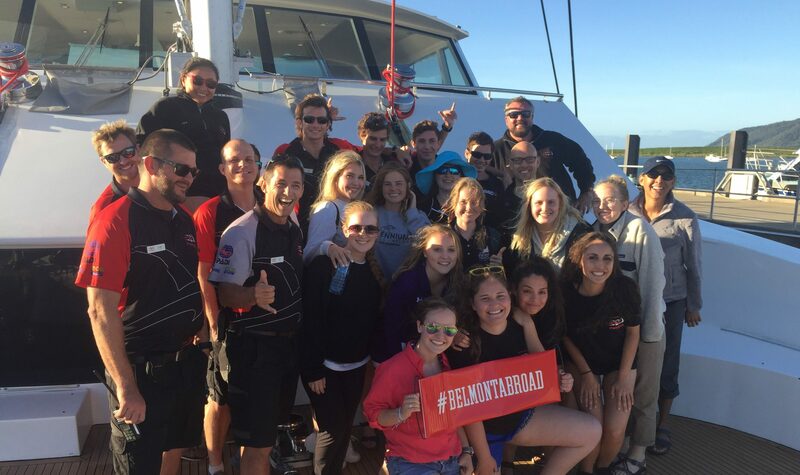 While traveling ‘Down Under,’ students were able to take full advantage of experiential learning opportunities, which allowed them to apply, critique and learn from different principles of activity and adventure tourism in real-world situations in real-time. Led by Dr. David Schreiber (Entertainment Industry Studies) and Dr. Marnie Vanden Noven (Sport Science), the trip’s course information was applied while students were snorkeling on the Great Barrier Reef, participating in a Sydney bike tour, and zip lining and canyoning in the world’s oldest rainforest, the Daintree. Students also enjoyed learning from industry experts while indulging in many of these experiential learning opportunities allowing them to appreciate the marketing and management of tourism activities and the potential problems involved in organizing such services. Classes provided students with an understanding of the evolutionary and current development of adventure and activity tourism as a significant sector of the leisure and tourism industries. Key issues relating to participation, team building, motivation, industry structures, destinations, environments, contemporary issues and influences of these types of activities on dimensions of wellness were examined in order to help students develop a contextual understanding of the activity amd adventure sector as it relates to the broader hospitality and tourism industry and personal well being. Students also collaborated on an international, interdisciplinary entertainment industry project with students from Australia and China. Working with industry professionals from Mushroom Music Group (Australia’s largest independent music company) and Live Nation (the world’s largest concert promoter), students worked in international teams to investigate, plan and present a project related to the primary and secondary ticketing markets within the live entertainment industry. Throughout this experience, students discovered how ticket scalping issues, including copyright implications and local legislation, influenced ticket pricing and availability in different markets around the world, and the role the industry was playing in addressing or ignoring these issues. Belmont students provided global context as well as cultural and business perspective from their own regions as they worked closely with industry executives and faculty.